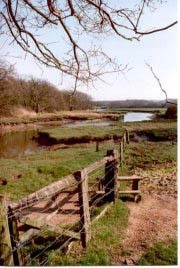 LOVERS OF RAMBLING AND WALKING CAN EXPLORE THE BEAUTIFUL HAMBLE VALLEY, WITH IT'S FINE COUNTRYSIDE AND RIVER SCENERY.I INVITE YOU TO BROWSE THROUGH THE PAGES OF MY WEBSITE FOR STUNNING PHOTOGRAPHS, SHORT HISTORIES AND WALK MAPS. 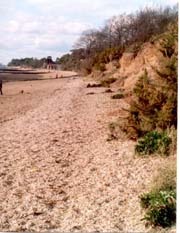 Born in the chalk downland of England's southern Hampshire, the river Hamble is one of contrasts. From its source near Bishop's Waltham it soon becomes a small stream, winding gracefully through pasture and farmland. The M27 roadbridge marks the sudden change of ambiance. 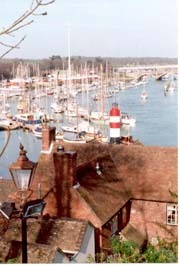 This is the Hamble known by yachtsmen worldwide, the forests here are of masts, and the banks lined by boatyards, and marinas with the occassional waterside pub, The Jolly Sailor being the most well known. Around 3,500 craft from millionaire's gin palace to sailing dinghy have their home on this part of the river, if you enjoy all things nautical, this is the place for you. There are however widespread saltmarshes which are home to many rare and endangered birds. Eventually discharging into Southampton Water, the river ends its journey to the sea. Either side of its mouth are beaches of golden shingle, from which you can watch some of the largest ships in the world, and contemplate on times gone by when vessels such as Titanic, Lucitania, Queen Mary and Queen Elizabeth sailed these waters. I hope you enjoy looking at my site, and if you are able, try some of the walks, or even the sea to the source ramble yourself. Have fun. At Botley Mill the waters become tidal, and the river starts to widen. With a country park, nature reserve and YMCA activity centre, flanking both banks, there can truly be, a no more beautiful stretch of river anywhere. Trees tumble down wooded slopes where their branches kiss the water. During the summer picnickers can sometimes enjoy the sight of victorian steam launches, puffing slowly up and down, brass glinting in the golden sunlight.